I missed posting last week, but most of you know I was busy at Sewing Summit. I feel like I have neglected this blog but it is not for lack of interest, perhaps the opposite. I have been so busy making things and doing things that I want to blog about, but I have not taken the time write the blog posts. This last week, as you know, I was at Sewing Summit and then in Park City for a few days celebrating Mr. Romance's birthday. I will write separate posts about these things later in the week, as time permits. I have gotten caught up with a few small bees and projects this week. My Mouthy Stitches package is winging it's way to it's new owner. I am so excited for her to receive it and also to see which of the beautiful totes I will receive. I get so excited about what I am making for my partner that I sometimes forget that I will be receiving a tote, too. This has been such a positive experience and I think credit not only goes to all the talented sewists in this swap but the three bee mamas for keeping it simple, concise and fun. Thanks to Hadley, Susan and Cindy for running such a great bee. Be sure to check out all the finished totes on the Flickr site. I also finished the October HST BOM in Jeni's quilt along. 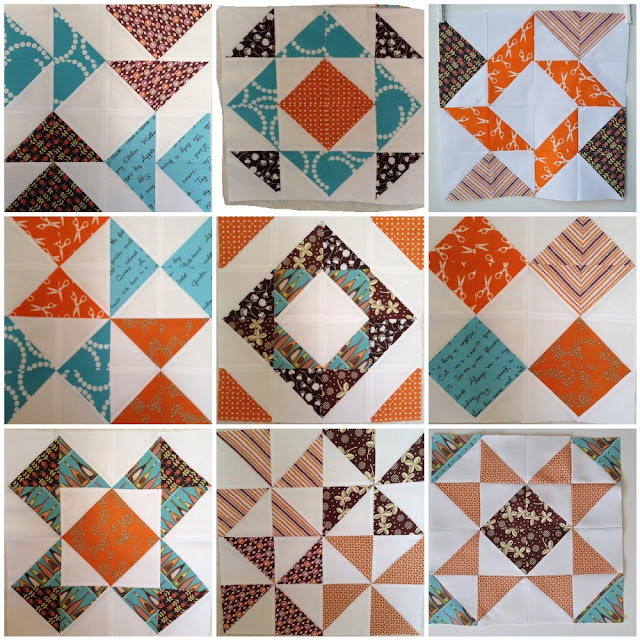 With only two more blocks to complete I will be able to decide how I will be laying out these blocks into a quilt. The Modern Stitching Bee has been a great experience. With only two blocks a month and everyone picking such lovely patterns, it's been a really positive experience. These are my blocks for Emily, who wanted wonky reverse stars, with bright, modern fabrics.. One large star and one small star. I also sent off a package to Brigitte, who designs for Moda. Her new line of fabric will be debuting at Quilt Market next week. She asked me to make some iPhone and iPad covers, using her pattern design. I'll wait until after Market is over to show you what I made for her sample sale. I can tell you this...you are going to love her new line of fabric. Love your modern quilt sampler. Ooooh! looking forward to seeing your iphone and ipad cases! Busy! Glad you enjoyed the swap and as everyone made amazing totes I hope you are thrilled with the one you receive. Your HST quilt is going to be beautiful...and from your IG photos, I know you had an amazing time in Utah. Your HST quilt is going to be gorgeous.....I like your fabric choice for your blocks. Have a great day! Your blocks are lovely and I am glad you had fun at sewing summit and after too. The blocks are beautiful. I am looking forward to Brigit's new fabric, I just ordered some of her first line.